As a fresh business graduate, I joined IDEO as a business designer. The world of design fascinated me completely. I wasn’t familiar with user-centricity and the power of design. but I quickly fell in love with it. Soon, I started to notice problems in the design community. I realized that it was so focused on the user or aesthetics that it forgot that there is no user without the business. Within the context of the business, design should be solving business challenges. Design has always been about business and sales. Even back in the days of the Bauhaus movement, which is still considered the starting point of a modern design. It was a way for German factories to differentiate from competitors in England and France. According to Thomas Edison, selling is also a sign of utility. If a sale is a proof of utility we can ask ourselves are we creating enough value if our users are not willing to become customers? Are we creating value if our design is not driving business results? Why do you think business invest in design today? Because of business results. For example, studies show that design-driven companies outperform the S&P by 219% over 10 years. Twenty years ago design was an afterthought. We weren’t invited to important strategic and product discussions. We were asked to make things look shiny right at the end of the process. We were fighting for greater importance and today we are finally here. 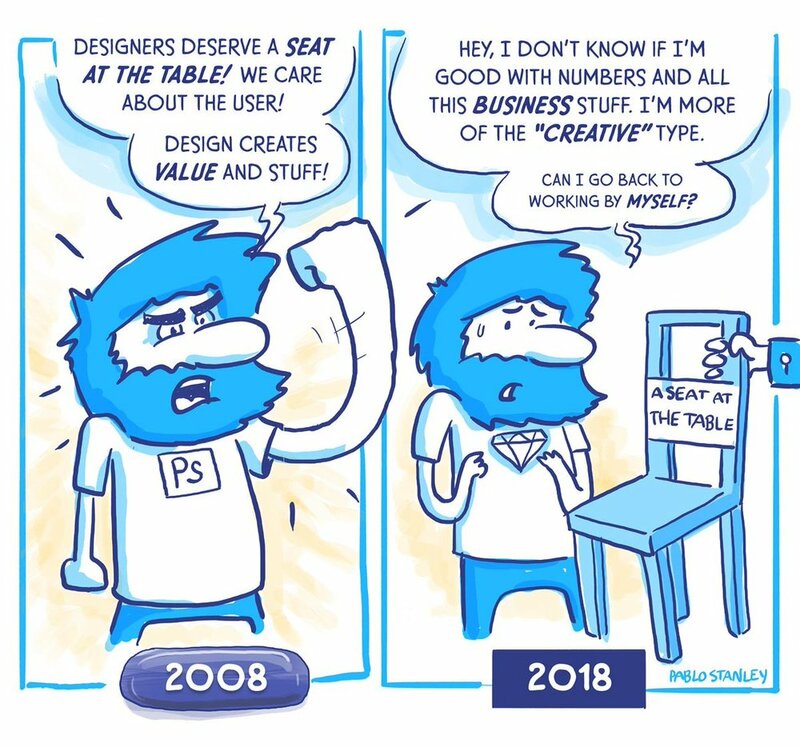 We, designers, have a seat at this famous table. But now that we are here, there is a danger that we will drop the ball. The same problem was described by Pablo Stanley in his famous comic series. With the increasing responsibilities and roles, it’s our duty to also develop our skills and capabilities towards business. I am not advocating that we lose the very thing that made us valuable. We should continue being user-centric. But if we want to grow and keep the importance of design in business, we need to understand how companies make money, how external and internal factors drive business decisions, how competitors decisions affect us, and how to measure our work. Think about it. The design community has fought for this for a long time. Are we ready to lose businesses trust in designers again? Let’s exercise our empathy toward businesses too. Many influential designers have started to talk about this problem but there are hardly any resources where designers can get this knowledge. Beyond Users is here to fill this gap. What design leaders are saying about business and design? "Design is about the customer not just the user." "Design goal should always be aligned with the business goals." "Business is an area where I see designers falling short the most."